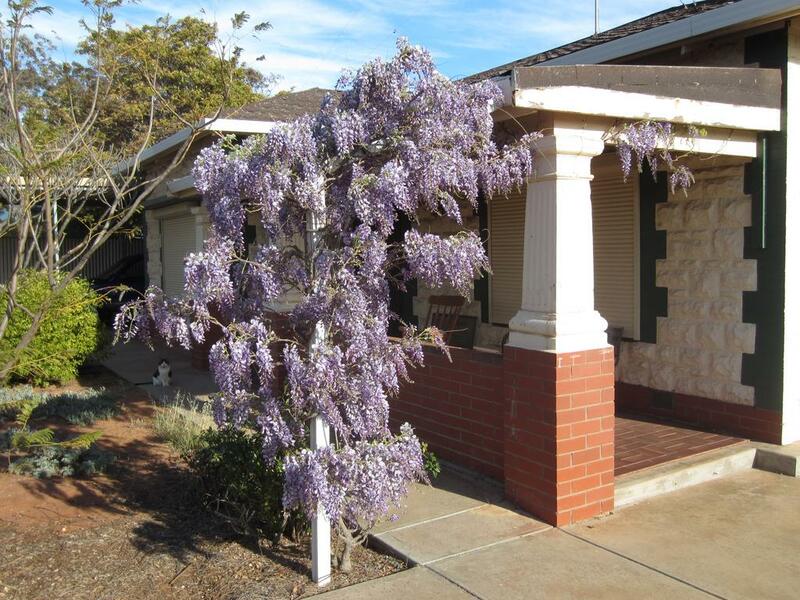 The wisteria had its brief, annual explosion. All over red rover in under two weeks. 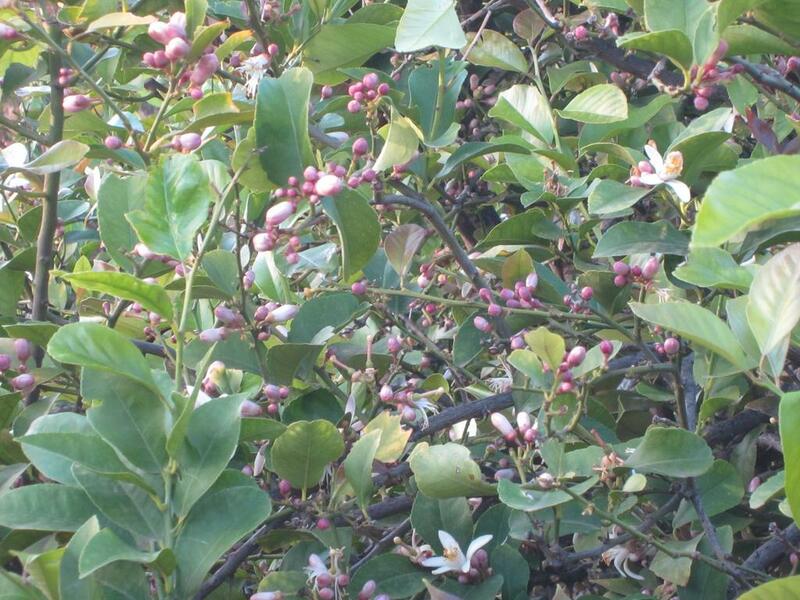 The bees are only moderately interested in it, the birds not at all, even though its sweet fragrance is as strong as that of the orange tree. No, nothing to do with the cat. Tom just follows me around everywhere. The cedar trees will be next. One has started flowering already. 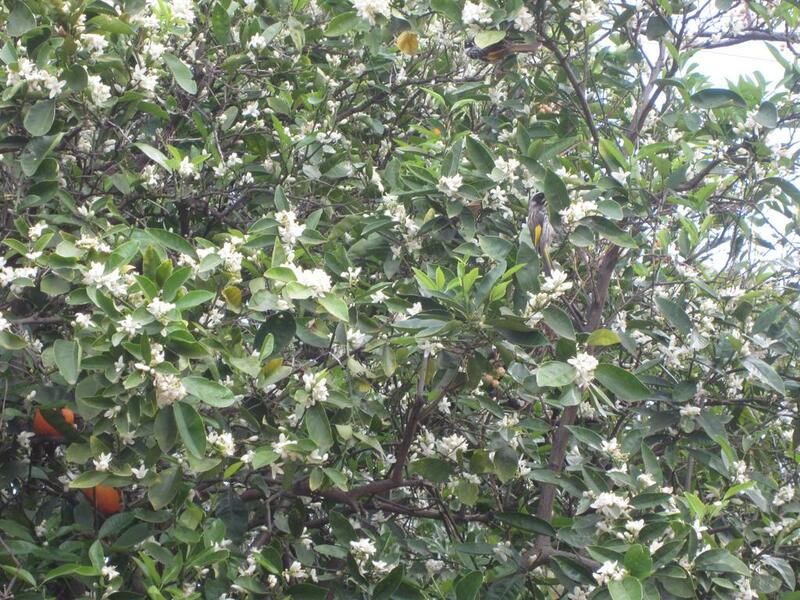 Their fragrance is just as sweet but not as overpowering as the orange tree's. I finally got the lemon tree going again. Provided I keep the increased watering up to make up for the drought, it should flower constantly all year round. The birds and the bees love it equally. I absolutely love wisteria, although we haven't got one. Most of our bee attractors are natives, but they also love the lavenders. Our garden/back yard is a blank canvas. Not much point in doing much now until Spring as once we have a frost. Plus there is still a lot of building noise around and will be for another three or four months. I am planning to make it small bird and bee friendly. So I want a creeper of some sort at one end of a long fence for shelter and some feeders near by. Clematis or wisteria. Advice most welcome as I am a novice at all this. In light of our very different environments I cannot give you concrete advice on what plants you might want to grow in your garden and which ones to avoid, but you might find the following general pointers helpful. First of all, take a look around while you're walking your dogs. What grows well in your area? It'll save you a lot of often futile effort. Take photos of plants you like but don't know anything about. Staff at plant nurseries are usually knowledgeable and very helpful in identifying them for you and advising you on how best to grow them in the hope that you'll walk away after having bought some of their stock. Don't open your wallet too readily, though. Quite a few of their five or ten pound offerings can be grown for nothing via cuttings from friends and neighbours, or for very little from small seed packets. That's an awesome orange tree Hermit! Thanks for the tips Hermit. As you may be aware England is a land of gardeners and there are garden centres everywhere. People are always keen to share advice, cuttings and the like too - as I recall from the days my dad had a large garden way back. The trouble here is all the houses are new (and thus the gardens) so it will be interesting to see how people develop them. A guy in a small house just over the road, for example, who clearly has never had grass to cut before, got his mower out just after some heavy rain had stopped and set it to cut on 'low'. The resulting carnage and quagmire was almost funny to see - as was the guy's expression of puzzlement. I have one pot of flowers in the garden so far. Onwards!